A 16-kilometre run that hits some of our favourite hills with military precision. 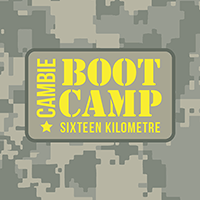 The Cambie Boot Camp Run is a hilly 16-kilometre run from Cambie and 7th Avenue based on the original Broadway Boot Camp Run we did in our Broadway Running Room marathon clinic. The original Boot Camp Run was an amalgamation of some of the favourite hills we did as individual repeats during the hill training phase of our marathon training at Broadway — King Ed, Nanton, and 29th Ave — as well as climbs on Fir/Marpole, Arbutus, 37th Ave and culminating with the long haul up to the top of Queen Elizabeth Park. 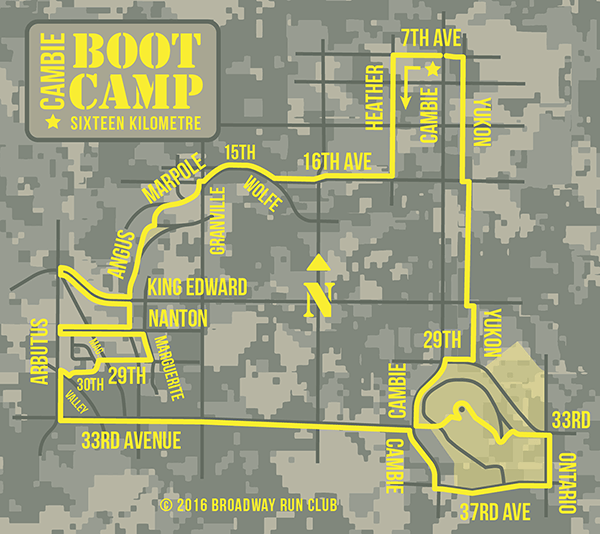 The new Cambie Boot Camp Run follows a similar path but after descending 29th, turns south on Arbutus and then follows 33rd to Queen Elizabeth Park up the C to C hill between Cypress and Connaught and the little kicker of a hill just past Eric Hamber Secondary. Once you reach the Lions Clock at the top of Queen E, drop and give us twenty! Mind if I join you tonight? Right, I want to do a mishmash of your boot hills and the FsRC hills so I may start a bit earlier than your clinic. Clinic meets at 6:30 and with no guest speaker tonight, we’ll probably be out the door by 6:45.